Yep,The US produces dehydrated banana flakes and slices for bakery applications, Korea produces banana powder for use in animal feed and Indonesia produces banana powder [for the same?] and some other countries like The Philippines, produce banana meal for livestock feed. And good news...India produces banana natural milk shake powder ! Oh, I heard banana milk is a favorite drink in Korea. Me, I like the Indonesian Pisang Sale, which is a sun- dried banana snack ...mm mmm good. Ok, sorry if you're now going bananas over my post. 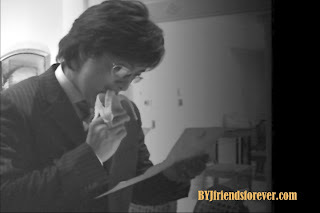 Ok Yong Joon ssi, I'll just leave you in peace to eat your banana and read what ever you're reading.. Source : Info from the net, photo of BYJ : credits as labeled.